And the San Sebastián Restaurant Week saga continues. 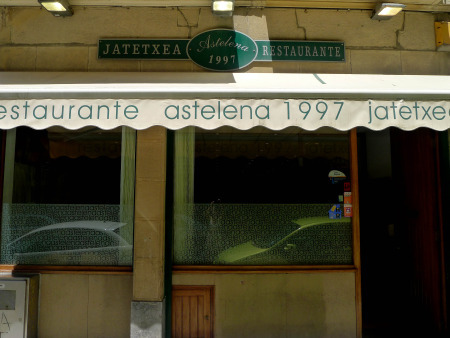 This time, I had the pleasure of lunching at Astelena. No, not the bar, the restaurant. 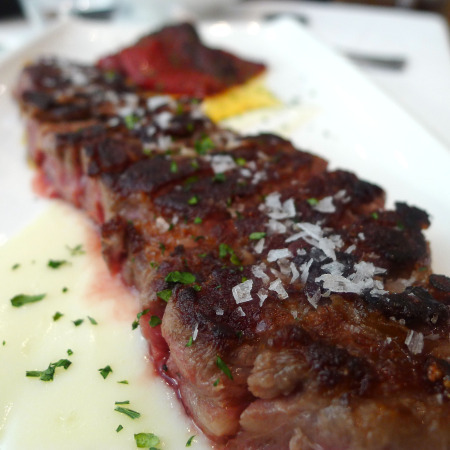 In one of San Sebastián's mysterious restaurant sagas (see La Cuchara de San Telmo and Borda Berri ), the pintxo bar in the Plaza de Constitución is ALSO named Astelena. Many a TripAdvisor user has been frustrated and confused by the name sharing. I frequent the bar but had always wanted to try the restaurant. It did NOT disappoint. This dish, ladies and gentlemen, renewed my faith in mid-level restaurants here in town. Way too often you find chefs more interested in showing off what they learned staging at _______ (fill-in-the-blank with some three star Michelin spot in town) than showing off the produce in the most delicious way possible. You are looking at fresh white asparagus, grilled in strips, a presentation that I have never seen here of the vegetable. Beautiful, so yummy. Another veggie plate, artichoke and cardoon. Topped with a rich broth. 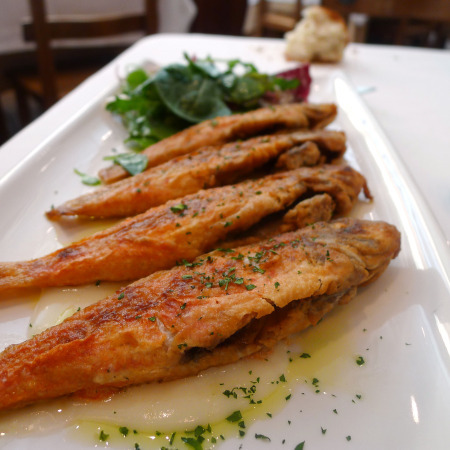 Four perfect, lightly fried red mullet. A beef filet, nicely charred and finished with oil and big, flaky salt. Another crowning glory, the pimentos del piquillo. I so appreciate a place that realizes they're not just for pulling from a jar and throwing on top of a steak. These were done right...cooked in a pan or oven to concentrate the flavor, given a little char, and served nicely seasoned. So good. Dessert was along the same theme...simple perfection. The typical torrija, basically a sweet French toast. 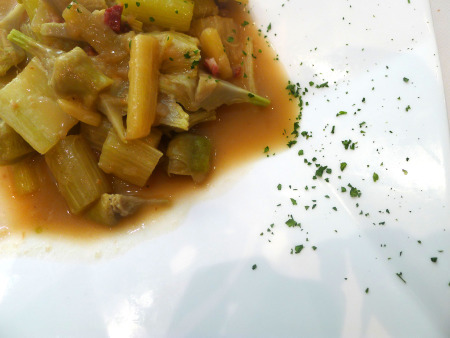 Then an interesting dish, reminiscent of the crema de queso at Narru (or perhaps vice-versa, not sure who came first): mamia with a canneloni of quince paste. Very of here, but in a presentation that is totally atypical and executed with skill. This is a restaurant I will go back to...and a restaurant I could see sending chef friends to, with a love for product that shows.